The Department of Medicine is one of the oldest clinical departments of the University of Benin Teaching Hospital. It renders both general and specialized clinical services to the hospital in a bid to meet its aims and objectives. 1. Expert care of patients with diverse medical conditions. 2. Teaching and training of undergraduate medical students and Resident Doctors in general Internal medicine and subspecialties of internal medicine. 3. Conceiving, nurturing and executing research ideas that contribute to the advancement of the knowledge of Internal medicine in Nigeria and Africa. 4. Rendering of assistance to other departments in the care of patients and training of Resident Doctors. Such departments include Community Medicine, Child Health, Ophthalmology, and Anaesthesia, Family Medicine and Dentistry. The Department has three medical wards (stroke ward inclusive) with a total of 87 beds. 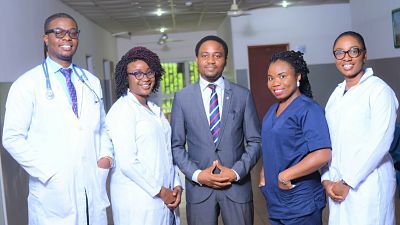 The stroke ward is the first of its kind in Nigeria, offering specialist and multi-disciplinary care to patients with cerebrovascular accident (stroke). There is a fourth ward, which is located close to the Accident and Emergency department , serving as its annex for medical patients requiring short hospital stay, stabilization with intravenous fluids or blood transfusion. Patients are usually admitted into these wards through the Accident and Emergency Unit, or from the Consultant Out-patient clinics. There are general medical out-patient and specialist clinics where patients are attended to throughout the week. Out patient clinics are held between 8.00 a.m. and 2 p.m. except on Wednesdays when they are held between 12 noon and 5 p.m. The Anti-Retrivial Therapy (ART) Clinics hold from Monday to Friday daily. This specialized unit renders hemodialysis to patients with end stage renal disease as well as those with acute renal failure. The unit currently has five Nephrologists, 3 Senior Registrars and 3 Registrars as well as Intern doctors. Other staff of the unit include trained Nurses, and technicians. There are presently 6 functional dialysis machines. This highly functional unit has 3 Consultants with facilities for daily Electrocardiography and twice weekly Echocardiographty. The unit also organizes training courses in Electrocardiography for Doctors and Nurses from time to time. This unit provides specialist skin care for those with dermatological challenges, and also care and counseling for HIV/AIDS patients. There are currently three Consultants in the unit. This unit provides care to patients with respiratory conditions, Pulmonary function testing is done every Wednesday. There is also a functional Asthma forum group which encompasses doctors, nurses and patients in the unit, providing an opportunity for patients to interact with their health care providers. The Unit provides specialist care to a range of Endocrinological disorders, including diabetes mellitus and thyroid gland disorders. There is a functional diabetic association encompassing Doctors, Nurses and patients, and this provides interactive forum. There are currently two Consultants in the unit. The unit provides enlightening services, in such areas as rational use of drugs and pharmacovigilance. There are currently four Consultants in this unit. Teaching and Training of Doctors. The Department of Medicine is involved in the training of Medical students at the 300, 400, 500 and 600 levels, as well as 500 level Dental Surgeons. The training is in the form of bedside teaching, teaching in the out-patient clinics, tutorials, seminars and didactic teaching in form of lectures. I Departmental clinical meetings on Tuesdays. Ii Postgraduate Seminars on Wednesdays. Iii Early morning case Reviews of Admitted patients daily. IV Clinical clerkship on Thursdays. In line with Departmental objective of specialized training, there are Resident Doctors in the various sub-specialties. The Department also hosts Residents from sister training institutions for clinical attachment in subspecialties such as Nephrology, Pulmonology, Neurology and Clinical pharmacology and therapeutics. She also hosts Residents from sister Departments such as family medicine, Community medicine, Anaesthesia and Dental Surgery. These Residents are expected to rotate through the Department as part of their Residency training. The vision of the department is to improve in present output and efficiency. This would be in the areas of teaching and training of medical students, and training and re-training of doctors, as well as in the area of research activities, for the uplifting of the department, and the hospital in general. There are opportunities for Resident Doctors to attend update courses, Research methodology sessions as well as Management courses outside the hospital. These courses are usually sponsored by the hospital. Consultants in collaboration with Residents usually carry out Research work in their respective subspecialties, resulting in journal publication and presentations at both local and international conferences. The Department currently has 22 Honourary Consultants. They all practise General Internal Medicine and also provide specialist services to their patients. There are 45 Residents comprising both senior and junior Residents. Other staff in the Department include 6 Medical Officers for the Institute of Human Virology unit, a Chief Typist, 2 ECG/ Spirometer , Technicians, Endoscopy / Technologist, a senior clerical officer attached to the ECG laboratory and a Head Messenger. Support staff available from the University of Benin includes a Machine Supervisor, a Clerical Officer and an Office Assistant.